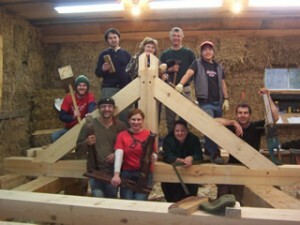 The beautiful craft of timber framing is exemplified by the work of Mark Davidson at Whippletree Post and Beam. Mark has been teaching workshops in timber framing and joinery since 2003. The intention of his workshops is to provide a good learning environment with an accent on positive feedback from instructors, and time for the whole class to share information. The combination of small class sizes with the use of handtools for the workshops, helps to create a course that is quiet, focused and relaxed. In the two-day joinery workshop, participants are provided with materials, plans and guidance for several different projects, with varying degrees of difficulty. Each of the projects go home with the participant to provide a reference piece for future work. Joinery courses are taught using hand tools including Japanese, Barr and Sorby chisels, carpenter’s square, knife, handsaws, boring machine, mallet and chisel, adze, hatchet and axe. Classes are taught at the Whippletree Workshop at 2025 Settler’s Line, near Keene, Ontario.